Julia Gorin is again shocked by amount of garbage in Tirana Albania in her latest post , but in her post she parallel Tirana garbage situation with some US soldier letter from Kosovo. Looks like both of them forget that Tirana is in Albania and Kosovo is soon to be independent state. But never the less garbage is garbage in any country, but how about Israeli garbage how do they dispose of it? Throw it on Arabs looks like, that must be Israeli great civilization and humanity which they want to show to world. Only one comment Julia "First clean in front of your house, before you look at other houses"
Israel plans to dispose of garbage on Palestinian land in the West Bank, and a Palestinian official immediately denounced it Monday as violating international law, saying, "We are not a dumping ground."' It will ruin all our groundwater, and it will pollute the air we breathe,' said a resident on the proposed landfill Israel plans to use to dump trash. The dump is to be built in a Palestinian quarry between the Jewish settlement of Kedumim and the West Bank town of Nablus, said Adam Avidan, a spokesman for the military's civil administration. The site is already being used. On Monday, there were thousands of tires, plastic bags full of household trash and plastic beverage bottles mixed in with construction debris in the old quarry. Palestinian negotiator Saeb Erekat said the plan violates international law. "We are not the dumping ground for Tel Aviv's garbage," he said, adding the Palestinians would complain to Mideast mediators and the World Health Organization. International law prohibits a state from using occupied territory unless it benefits the local population, experts say. Israel captured the West Bank from Jordan in the 1967 Middle East war. The law means residents of occupied territories "are supposed to maintain the normal life they had as much as possible," said attorney Reuven Laster. "If you're talking about trash from Israel and depositing it on the other side of the line, you're certainly reducing their quality of life, and you're doing it as an occupier," he said, and that "doesn't look good under international law." Avidan said the landfill didn't violate international law because Palestinians would also be allowed to use it. It's not the first time Israel has exported its refuse to areas over its 1967 borders, but this dump is one of the biggest, if not the biggest, Avidan said. Four Palestinian villages stand within one to two miles from the landfill. On a hill about 500 yards away stand thousands of olive trees. "It's scary what they're doing. It will ruin all our groundwater, and it will pollute the air we breathe," said Nasser Salman, from the nearby village of Kotzin. "They can't build a landfill near the olives and almonds we eat." Avidan and Environment Ministry spokesman Sharon Achdut said those concerns were unwarranted, because the landfill is to be sealed and is to take only dry waste, and not household refuse that could pollute groundwater. But an Israeli contractor authorized by the Kedumim council to operate at the site before the landfill was approved dumped household garbage and tires there over the past six months without sealing it first, Avidan said — a fact that calls into question the military's ability, or resolve, to keep environmental hazards out. 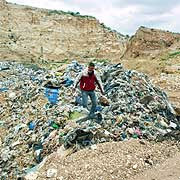 The civil administration has issued orders to close the landfill until the Israeli contractor, D.S.H., removes the household waste it buried and seals the quarry floor, Avidan said. D.S.H., the Kedumim Council, and Baron Park, the settler-owned company building the landfill, did not return calls seeking comment.